CPS Camp No. 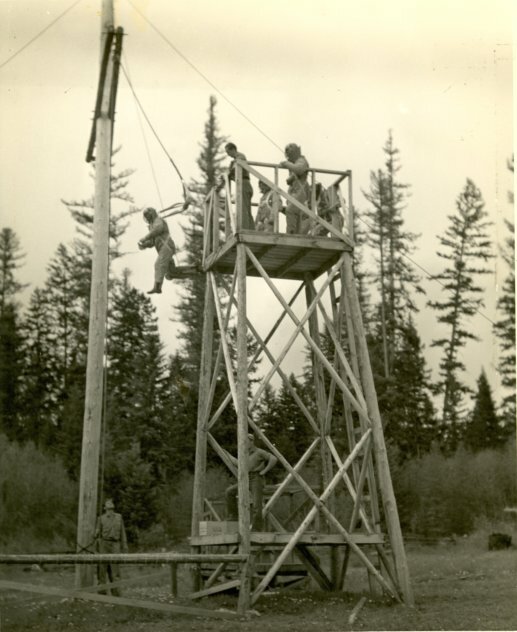 103, a Forest Service base camp in Missoula, Montana operated by Mennonite Central Committee in cooperation with the Brethren and Friends Service Committees, opened in May 1943 and closed in April 1946. 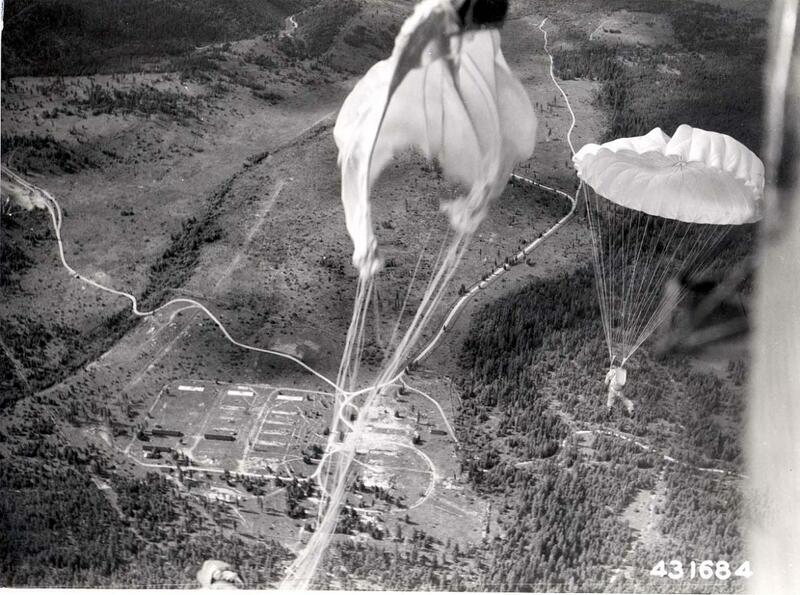 Men in the unit, highly trained, parachuted into rugged country to put out forest fires; in down times they performed prevention work. Dale Yoder at CPS Camp 103. Accurate steering cannot be done and gusty winds may cause the jumper to land among the trees. 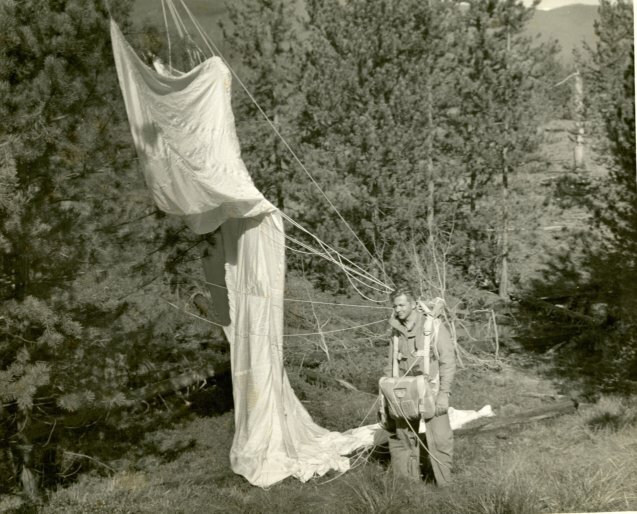 Although the silk materials of the parachutes are unusually strong, repairs must frequently be made on them before they're repacked. 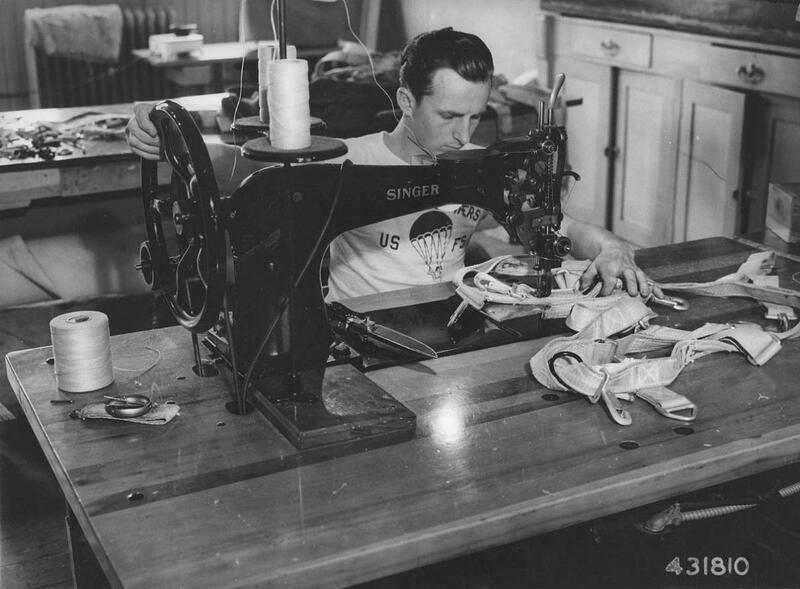 Civilian Public Service camp 103, Missoula, Montana. Left: Glenn Smith, Forest Service, Squad Leader. Right: Harry Mishler. 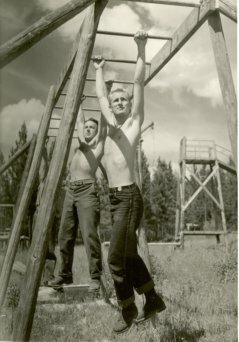 Civilian Public Service camp 103, Missoula, Montana. The horizontal ladder. Part of the obstacle course. Left to right: Oliver Huset, George Leavitt. 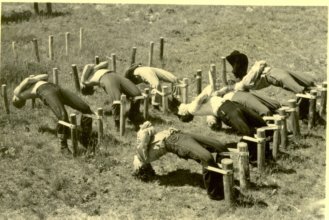 Civilian Public Service camp 103, Missoula, Montana. 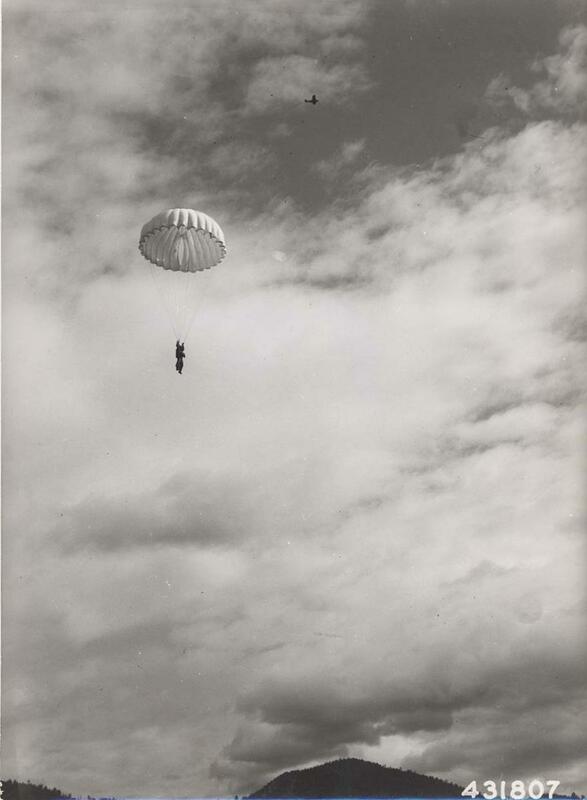 A jump from the training tower simulates jumping from a plane. 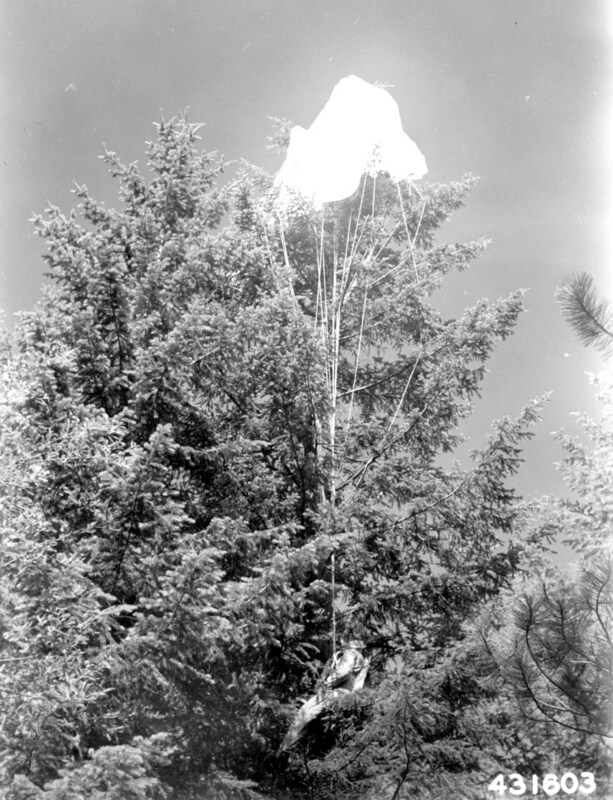 The same procedure and technique is followed as in a real jump, and the shock when the rope pulls taut is approximately equivelant to the opening shock of the parachute. Civilian Public Service camp 103, Missoula, Montana. Training. Civilian Public Service camp 103, Missoula, Montana. 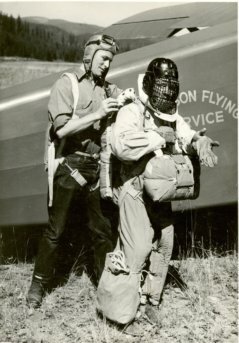 Smoke Jumpers Camp. 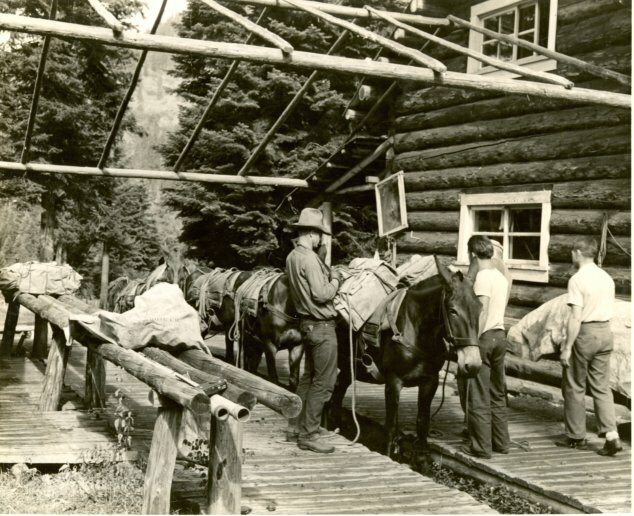 As soon as jumpers are dropped to a fire, a mule string carrying additional food supplies starts out to the scene via trail.